Hello, Ribbon Lovers! I don't know what the weather is like in your part of the world, but here in North Carolina, Spring has Sprung! I can't believe that daffodils, Bradford Pears, Forsythia, Red Buds and Crocus are already blooming. My back yard is filled with lovely wee birds singing their heads off. It's a very early spring for us. All this beauty and fine weather inspired me to have a play with the March Ribbon Club Rainbow Assortment. There are so many great ribbons to choose from, but when my eye fell on this dreamy Tropic Taffeta Ribbon, I knew exactly what to do. I tell you, my friends! I am in looooove with taffeta ribbon. It ties the most gorgeous bows ever! Bonnie carries it in several different colors in the shop, and I want them allllll! I used my Zutter-Bow-it-All to tie a triple loop bow. Then I topped it with a triple loop string bow tied with ivory burlap string. 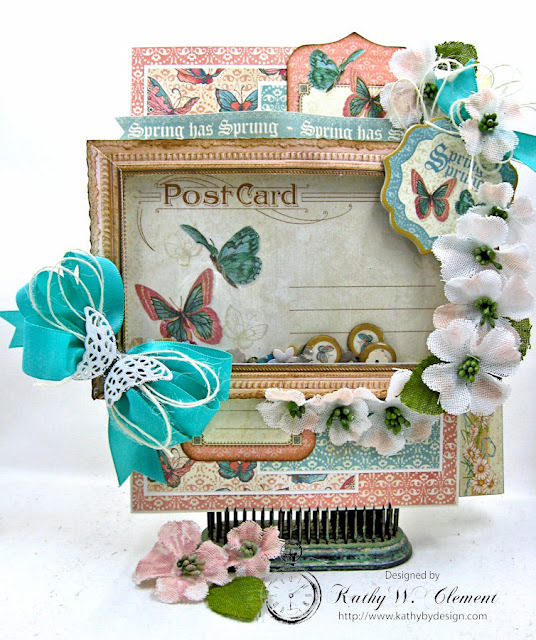 What better way to celebrate the fact that Spring has sprung than making a pastel butterfly shaker card? This 6" x 7" card has a cutaway edge and is made with Graphic 45 Sweet Sentiments Paper. 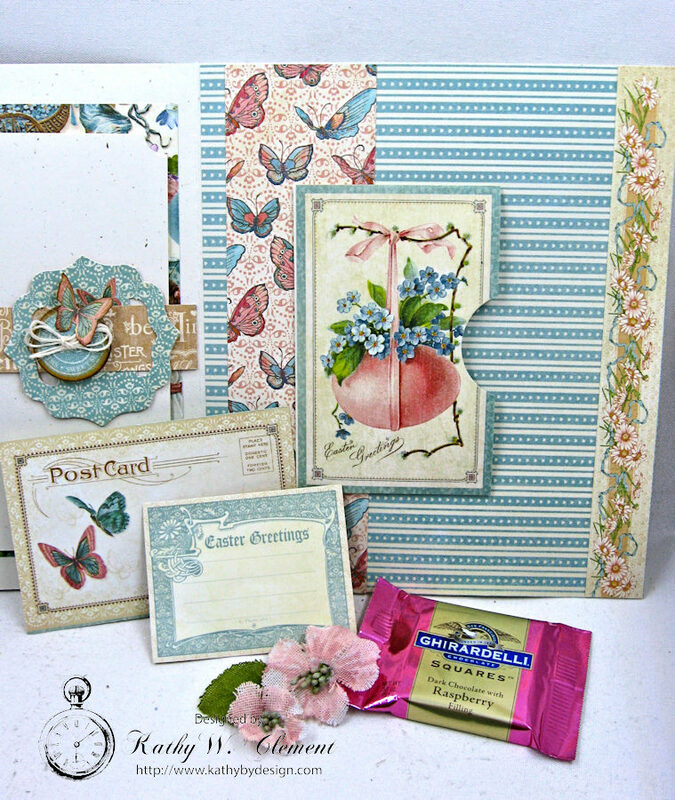 I love the fact that the Tropic Taffeta Ribbon picks up on the blues in the butterfly wings! Inside the card, I created a belly band to hold a bunch of 4.25" x 5.5" photo mounts. This would be a great place to save pictures of your family Easter celebration. 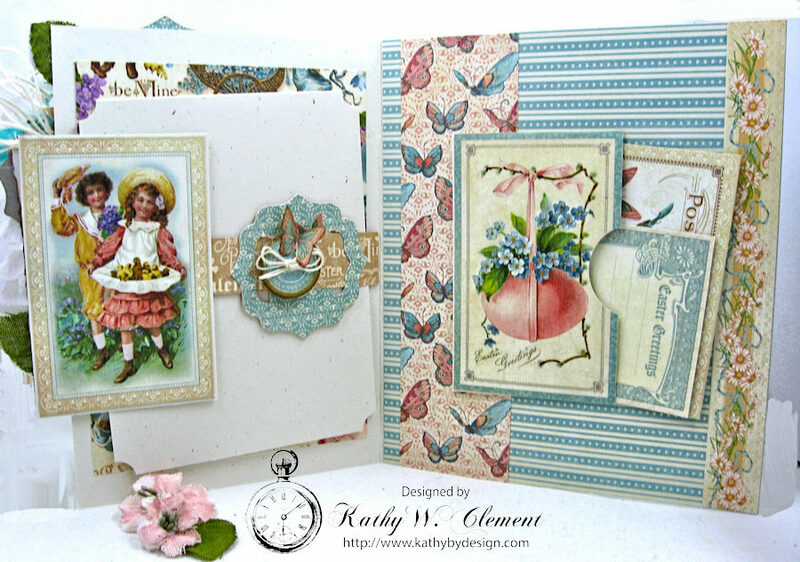 I created a little pocket on the right, then added some journaling cards from the collection. This is a nice place to write a special sentiment or do some journaling. Oh, and there's chocolate in the pocket...because....well it's Easter! Have you had a play with the Ribbon Club Assortment yet? If so, then you know how fabulous it is! If not, then you are in for a real treat! If you're not a member of the Ribbon Club yet, now's a great time to sign up. You can find all the information right HERE. You won't regret it!